TalkCPR has been shortlisted for an NHS Wales Award within the ‘Improving Quality Together (IQT) Methodology’ category. The awards ceremony will take place in Cardiff on the 23rd September. 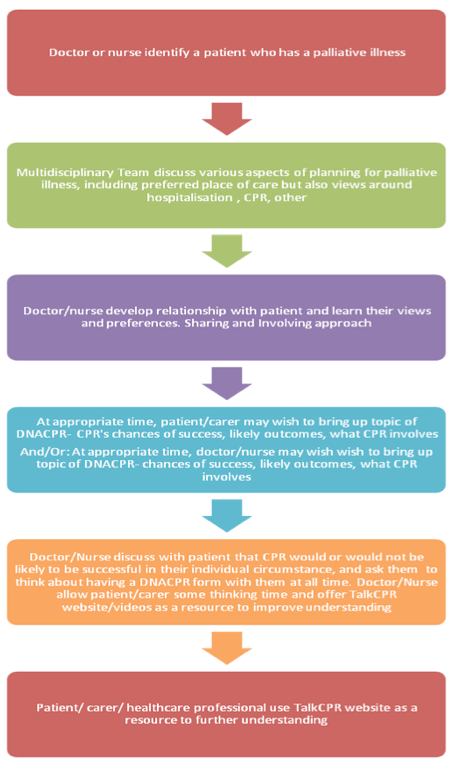 The aim of the project TalkCPR’ is to ease communication and dialogue between patients with palliative illnesses and their healthcare professionals in relation to the complex area of Do Not Attempt Cardiopulmonary Resuscitation Decisions (DNACPR). In order to facilitate effective communication and transfer good quality knowledge to patients and those close to them, a novel video and website approach was used . Talking about CPR in palliative and life-limiting illness is important. It is best to discuss CPR when a person is still reasonably well and able to express an opinion on whether the intervention is something they would consider appropriate for themselves or not, should it become necessary in future. There is a need to explain this procedure better within society, and also to create reproducible ways of giving clinicians opportunities to gain confidence in talking about this hard topic more often. Since the TalkCPR resources were made available online TalkCPR has been featured in The Guardian, and The British Medical Journal’s Supportive and Palliative Care journal. TalkCPR has now also been included within NICE guidelines as a shared learning resource that links with a number of NICE guidelines. The Digital Legacy Association has provided regular support and consultancy over the last year for this campaign. We built and designed the Talk CPR websites ensuring that the content was available in both English and Welsh. By hosting TalkCPR on standalone websites and on the NHS Wales eCRM we have been able to reach and engage with a wider audience of professionals and the general public. When making decisions about CPR and DNACPR, it is important that the information is not only of the highest quality but that it is also presented in a logical and easy to understand way. We designed clean and easy-to-use websites using suitable colours, images and formats to make learning more conducive. All content can be viewed on computers, mobile phones and tablets. Since its launch in 2016, TalkCPR has received nearly 100,000 website hits. TalkCPR is a useful educational resource for professionals. The video resources have been evaluated with junior doctors and nurses.. Evidence highlighting how confident professionals are at discussing DNACPR before and after watching the videos can be seen in the charts below. Pre- and post-video questionnaires were undertaken with a group of nurses and doctors (at separate teaching events) in order to elicit their readiness to see, view or even recommend a video about DNACPR to someone else, and to also elicit how appropriate they found this. A focus group session was held with a patient liaison group during which the TalkCPR videos were shown and subsequently discussed. How ready do you feel to answer questions on Do Not Attempt CardioPulmonaryResuscitation (Dnacpr) planning decisions from patients? How ready or unready is the general public to see an information video on DNACPR? How ready are patients/carers to see a video about DNACPR in a clinical area, ie a hospital bed or GP practice waiting room? How ready would you be to show an information video to palliative patients/and or their carers on this topic, if you had a portable computer that made this easy? How ready would you feel to suggest a video on the topic of DNACPR to another member of staff? Do you think palliative care patients are ready for such a video, as a newer form of communicating complex areas of care if it can add-on to vital face-to-face discussions?